This weekend we braved the cold winds and went to see Avatar. It is a gorgeous movie! I would love to know the people who created the creatures and plants--they have amazing imaginations. I was in awe much of the time by the sheer beauty of the effects and unusual creatures. It was spectacular! The storyline is very familiar. White folks (mostly anyway) find a new land that has a mineral, unobtainium (ok, couldn't they have gotten a bit more creative here? ), and seek to destroy all the people, creatures, and land that could prevent them from getting to it. Then one of the white men falls in love with the chief's daughter, becomes a better Navii than any of the actual Naviis and leads them in fighting off the other whites. Can we ever move beyond this plotline? Could the indigienous peoples ever save themselves? Could the whites ever learn or incorporate the widsom of the indigienous peoples? One thing that was a bit unusual and nice to see, was that the Navii did not seem to discriminate between men and women--they did not follow male vs. female roles, both males and females were hunters and warriors (we didn't really get to see other roles but I trust they would be consistent). I look forward to it coming out on video and hopefully using clips for sermons or youth group/Sunday School. It is rich with religous themes of baptism, being born again, our interconnectedness and relation to God. I'm sure somone is writing the official book about it as I write. The storylines are familiar, as are the characters, and even their religous portrayals. The cinematography makes it all worth watching. 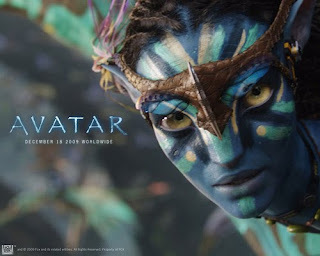 Over at Jesus Manifesto there is an article about people who are struggling with depression (some sounds pretty severe) after watching Avatar! These folks were so drawn in by the beauty that their reality no longer meets their own needs and some even feel suicidal. I never imagined that sort of reaction! What does this say about the state of our culture and society? there is lots of depression in our culture these days...I've heard good things about this movie, but not its connection to depression....wonder what that is tapping into? yes, "what is it tapping into?" that is a better framing of my question. i know there is quite a bit of depression (I've struggled with it most of my life), i was just shocked to hear it related to the movie. Thanks for the review...I was afraid the plot would be exactly what it seems to be. No interest in seeing it, even if its beautiful.